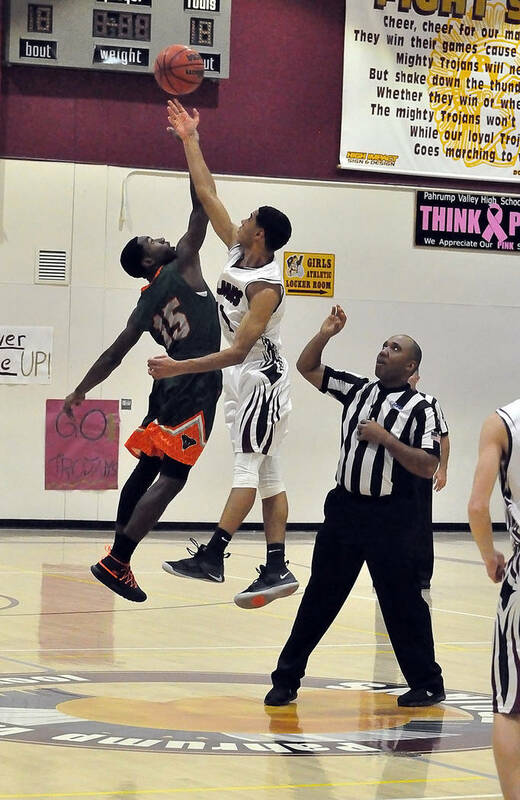 The Pahrump Valley High School boys basketball team played two very different halves Tuesday night against Mojave. Horace Langford Jr./Pahrump Valley Times Junior guard Grant Odegard works his way past Mojave's DeSaun Smith during Tuesday night's Sunset League game in Pahrump. Horace Langford Jr./Pahrump Valley Times Pahrump Valley senior Garrett Ward drives to the basket against Mojave during Tuesday night's game in Pahrump. Horace Langford Jr./Pahrump Valley Times Senior Ethan Whittle wins the opening jump ball for Pahrump Valley on Tuesday night against Mojave in Pahrump. After being almost even with the Rattlers for much of the first half, the Trojans were completely noncompetitive after the intermission, as the ruthless Rattler press turned steal after steal into basket after basket to the tune of a 69-33 rout in a Sunset League game in Pahrump. What was a close game three-plus minutes into the second quarter became a laugher for the visitors courtesy of an improbable 26-4 advantage during the third quarter. A Trojan team that had some success breaking the press in the first half suddenly barely could get the ball in play without turning it over, leaving Pahrump Valley coach Dan Clift shaking his head. “I was sitting there on the bench just baffled that we couldn’t get the ball inbounds,” Clift said. “Then I thought, he (Mojave coach Adam Schwartz) probably chewed their butts out at halftime. That’s a really good basketball team that didn’t put that kind of pressure on us early. Indeed, Clift didn’t have to, because the Trojans (4-14, 0-5 Sunset League) were having some success getting the ball across midcourt. From there, it was a mixed bag, with successful layups, putbacks and drives in the lane mixed in with bad passes and Mojave steals. With Brayden Severt scoring all of his team-high 9 points during the first half, the Trojans were right there, and when Chance Farnsworth hit a shot off the glass in the lane at the 4:41 mark of the second quarter, the Trojans were within 20-17. It should have been even better, but the Trojans’ habit of missing easy shots continued to haunt them against the Rattlers. On the next trip down the floor after pulling within 3 points, Farnsworth committed his fourth foul. 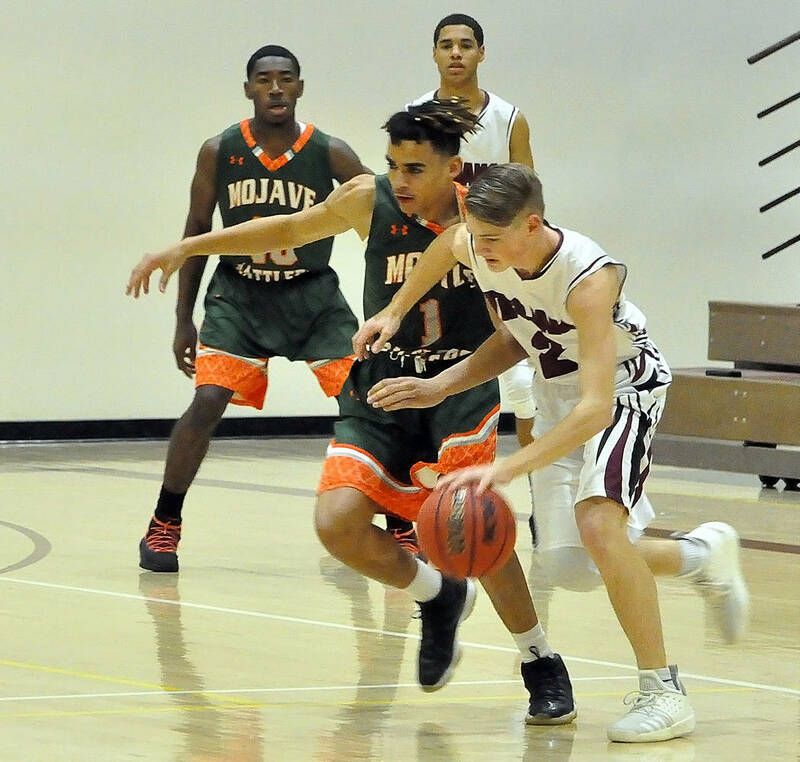 Almost every game, a key player has been in foul trouble for the Trojans, and after Farnsworth, who scored 6 points during the first half, went to the bench, Mojave (14-6, 4-1 Sunset League) went on a 19-7 run to take a 39-24 halftime lead. The third quarter was just brutal for the Trojans. An opening 8-0 run was stopped by two Grant Odegard free throws. Another 8-0 run was stopped by Caleb Sproul hitting from 12 feet out. A 10-0 run took up the rest of the quarter, by which time a 35-point lead brought on the running clock. “This is the fourth or fifth game (with a running clock),” Clift said. “I know that’s hard. At this point in the season, we’re all beat up, but it’s about pride. It’s about us showing up and playing well. I can’t focus on the 35s. We need to come out and play well regardless of what the score is and do things we’re capable of, and that’s not turning the ball over, breaking the press, handling the pressure. The very physical game saw 22 fouls called on the Trojans and 21 called on the Rattlers, and neither team managed to shoot 50 percent from the line. Farnsworth and Odegard each scored 6 points for the Trojans. Mojave’s Isaiah Harper led all scorers with 15. 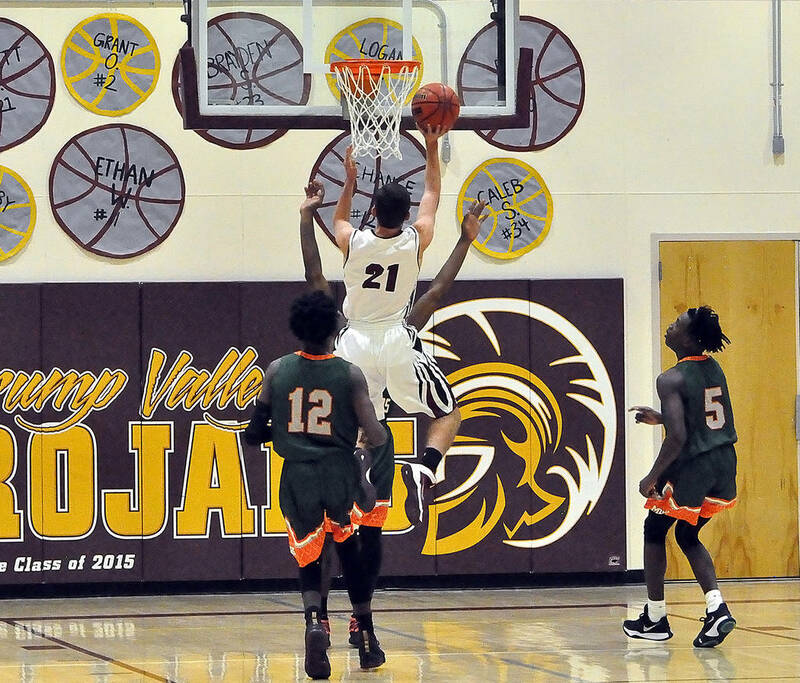 The Trojans played Valley in another Sunset League game Thursday night, but they then face two nonleague teams: Somerset-Losee (2-8) on Monday in North Las Vegas and Lake Mead Christian (9-6, 5-4 Class 2A Southern League) on Tuesday in Pahrump. Clift sees an opportunity to add to the win total.